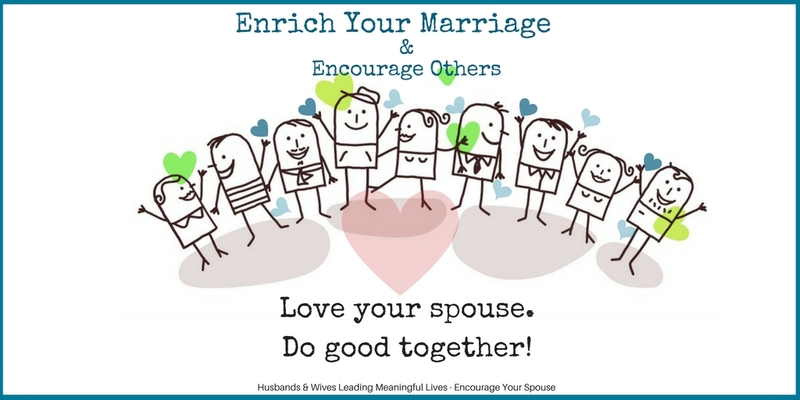 Enrich your Marriage AND Encourage Others – Are you making the most out of your relationship? Or are you just coasting along, making life work for you? 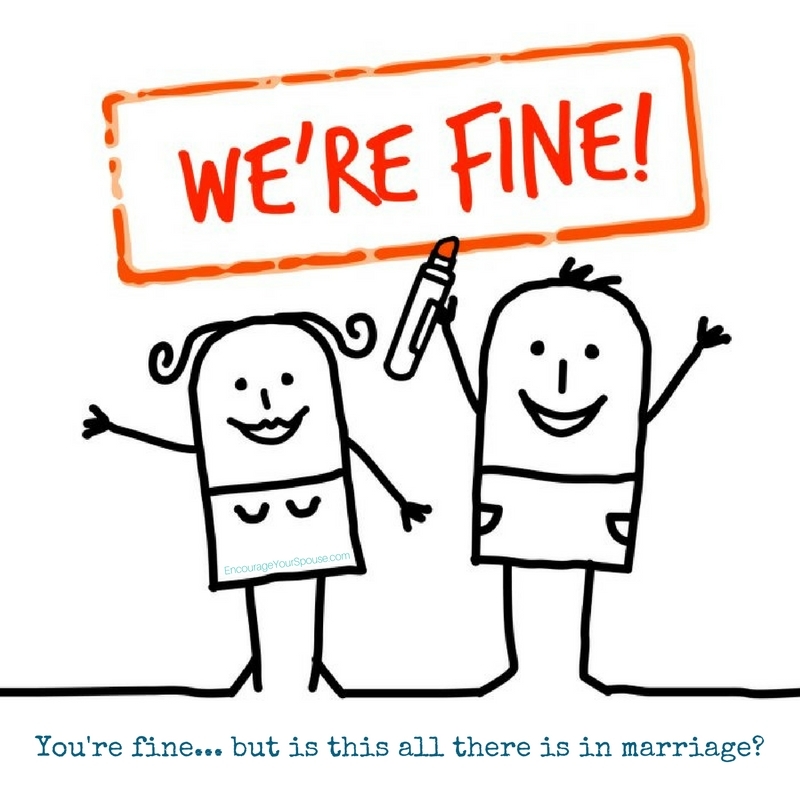 Is your marriage “Just fine.”? You’ve been married for a while, right? Maybe a few years… maybe a few decades. And you like spending time with each other… dating your spouse is fine. You’ve done the dinner at a restaurant more than once. (Probably more than 100 times if you’ve been married a few decades.) You’ve gone out to see a movie. You might even do fun things together like go to car shows, go antiquing or thrifting, play golf or tennis, tour on your motorcycles, or sail your boat, train for marathons or hike local trails. You enjoy your time together – it’s all fine. So now what? What happens for the next few decades… more of the same? A powerhouse for good. What does that mean? It means that you leverage your “just fine” marriage relationship… it means that you kick your “just fine” marriage relationship up a notch… it means that you invest in yourselves and others to lead a life that’s filled with meaning! But you still have kids at home – what about them? Let them see you doing good while strengthening your relationship, and it’ll inspire them. You’ve heard the saying, “The best gift you can give your children is loving your spouse.” Right? Go one further – continue to love your spouse, but do good together! Now wouldn’t that be a valuable action? – for you and your spouse – for your kids, family, friends and your community? 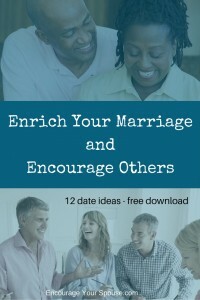 12 Dates – 12 ways to enrich your marriage AND encourage others! Create a “Take It Easy” basket for a friend. Enrich Your Marriage: Discuss the idea of relaxation with your spouse. Make a list of all the things that she/he (you both) find relaxing. Be specific. You might discover something you didn’t realize about your spouse. Over the time we’re together we continue to change as people. What we found exciting in our 20’s we might not find great today… couldn’t that be true about relaxation also? Items to consider would be music, chocolate, warm socks, DVD, etc – think of the 5 senses. Encourage Others: Agree to a budget. Purchase some items from your list and put them into the basket. Drop it off at your friend’s place. Sharing what you love is a sign of care. Though you can’t know exactly what will bring joy to this person, your care will shine through. What makes your spouse relax? Find out! Enrich and Encourage together. Enrich Your Marriage: Talk about your experiences with those who are elderly. Are your grandparents still alive? Parents? What are some of the upsides and downsides of growing older? Do you have some fears? Do you share the same fears? Are they different? Why? This might not be an easy conversation, but it’s important. No matter how old you are now – you’re growing older. You’ve vowed to live your life with your spouse. Understanding how she/he feels about time/bodies/lives changing is valuable. 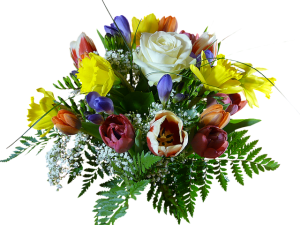 2 bunches of flowers – date night to enrich your marriage and encourage others. Enrich Your Marriage: What treats do you remember from when you were growing up? Wagon Wheels (Maybe that’s just in Canada?) Candy cigarettes? Shoe-string licorice? Reminisce for a bit as husband and wife. Sometimes we lose track of the fun stuff from our childhood within the seriousness of life. That child – or parts of that child – is still alive in you and your spouse. The memories will make you smile. Smiling together is precious. Encourage Others: Buy a bulk bag of candy/chocolate bars – make up little packages and give them to the kids in your church’s Sunday school. Good memories. Learn more about your spouse and encourage others. Encourage Others: Go to a bookstore – or look online – and buy an extra copy of your favorite book. (Or a book you believe would be your favorite once you’ve both read it.) Give it to another couple to enjoy. Share your taste in books with your spouse – then encourage someone else. Encourage Others: Make list of knock-knock jokes – keep ‘em clean! – and phone a friend to tell them the jokes. Take turns. You’ll all end up laughing! And become healthier! Laugh together – get healthy – then make someone else laugh! Enrich Your Marriage: Do you know your spouse’s favorite Bible verses? Do you know the stories behind those verses – why they are important to your spouse? Sit together and gather a list of your favorite Scripture verses. Maybe 8 or 10. Encourage Others: You can either write each verse – individually – on card-stock squares, or use your computer skills to create an attractively spaced document to cut apart into squares. Put the finished product into an envelope and mail them – anonymously – to someone who is going through a hard time. Add a note to tell them they’re not alone. Scripture provides comfort and joy – enrich your marriage and encourage others. Enrich Your Marriage: I’m guessing that not many couples bake together. Are you one of the few? If so, great stuff! Try a new cookie recipe and indulge your gifts in the kitchen. If you’re not used to baking together, there’s a unique togetherness that comes from co-operating to make an end product. I can’t explain it – you’ll just have to try it. Cookies! mmmm – bake some for each other and then share! 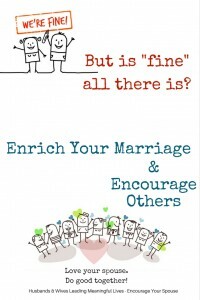 Enrich Your Marriage: This is an activity to bring out the kid in the two of you. You’re not as old as you might feel… Remember those gumball machines (or candy dispensers) in the grocery store? Map out a plan to drive past all the grocery stores/malls in your area. Then spend an evening/afternoon in the car together with a fun mission. Gumball Rally – be stealthy – don’t give away your mission! Enrich and Encourage! Encourage Others: Once you’ve organized and the CDs into piles, gift those you no longer love to a nursing home. Or the Library. Or a hospital ward. You’re sharing something you onced loved enough to spend money on… let someone else have the gift of that music to enhance their life. Music is a gift for every age and stage – enrich your marriage and encourage others. Enrich Your Marriage: Not everyone’s love language is words of affirmation, yet a few words or phrases spoken for comfort and affirmation won’t hurt anyone. Imagine the concept of a huge tank (like a water tank) that’s called a “love tank”… it can be filled up in many ways: words of affirmation, actions serving one another, physical demonstrations like hugs and loving touches, little gifts, and time spent doing something together. It’s good to know what your spouse’s primary love language is (one of the five), but filling the tank can include all of the love languages. This enrichment activity will key you both into which words resonate with your spouse. Go to a card shop. Pick out cards which appeal to you, and taking turns, read them to your spouse. First you read a card you’ve chosen as special. Read it. Watch your spouse’s reaction. Does the words/sentiment you’ve chosen resonate with your spouse? Yes? Why? Is it what you expected? No? Why not? 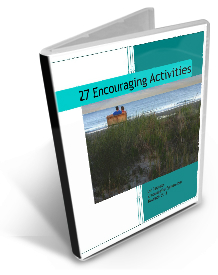 You’ll learn a lot about your spouse in this activity to enrich your marriage. Words to affirm – for your spouse and for others. It’s a date to enrich and encourage. Enrich Your Marriage: Which leaders in your life – teachers, ministers, coaches, etc. – made a significant impact in your life? Each of you make a list of these signficant leaders. Show each other the list. Does your spouse know about all these people? I’m guessing there are going to be a few surprises. And if your spouse can recognize the name, does she/he really understand the details of this leader’s significance to you? Spend some time telling stories about those people – share with your spouse how these people have made you the person you are today. Encourage Others: Some of those leaders on your lists won’t be available today – so you’re going to do this as silent tribute. Buy a bag full of mints. Or maybe two kinds of mints. Put them into a jar and label the jar with: “Thank you for your involve-mint, commit-mint, and encourage-mint.” Take the jar to your local school (or church, or volunteer organization, etc.) and leave it in the office for the teachers. They don’t need to to know you. You don’t need to know them. This action is about reaching out to affirm these leaders as they make a difference in other lives. Encourage-mint… it might be corny, but it’s sweet! A date to enrich and encourage. 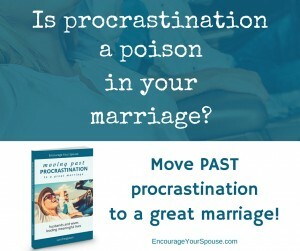 Enrich Your Marriage: Are you past the stage of little ones in your home? I’m guessing some of you are. Maybe your kids are teens. Maybe they’re grown. Maybe you don’t have kids. This activity is to take action in a way that will positively impact another couple, while empathizing with the stage they’re in. Do you know of a couple with young children? (I’m talking under 5 years of age.) You could know them as neighbors. You could know them from your church. You could come in contact with them through a school, a sports connection, a hobby, or event. That young couple could be your grown kids. Or friends of your grown children. Narrow your thoughts to one particular couple. Think of this couple. What do you know about them? How are they similar or different from the two of you? Can you relate with the stage they’re in? At all? Chances are life is filled with new expereinces – and not all of them are fun. Chances are they’re not overflowing with extra cash – it could be that paying their bills every month is a challenge. Chances are they have a small circle of family support (parents/grandparents/aunts/uncles) who live close by. And even if they live close, they’re not always physically or emotionally present in their lives. Enriching a marriage when raising young children is difficult. (I think you might remember?) This is the point in time where many marriages go off the rail – and never recover. Two people who love each other lose their connection. It takes time and effort to continue to grow through the “young children” stage. Can you relate? What do you remember about this time in your life? Reach out to encourage: This is not a quick action. Make a plan to get to know this younger couple. Be deliberate. Talk to them in passing. Ask about their children. Ask about their work, their life ambitions, or their hobbies. Let them get to know you. Give it time for them to know and then like you. Time for them to trust you. Yes, it’ll take time to build a healthy relationship. It’s not about giving advice – just being kind. It’s not about giving instruction – but being a listening ear. It’s about a friendly smile, an extra helping hand, or a word of affirmation, when life is tough. Wait for the time it’s appropriate to offer to provide childcare for an evening, so the younger couple can go out on a date. (They’ll need to really like and trust you first – this won’t be appropriate immediately.) Maybe, if you have the funds, it might be possible to provide a gift card to a restaurant. How can you bless another couple? 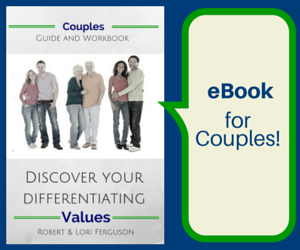 How can you leverage your marriage to become more and add value to another couple? You could do these actions over a year – one a month. Some are just for fun. Some have little cost involved – others can be as extravagant as you’d choose. Some are a deeper, more time consuming activity. 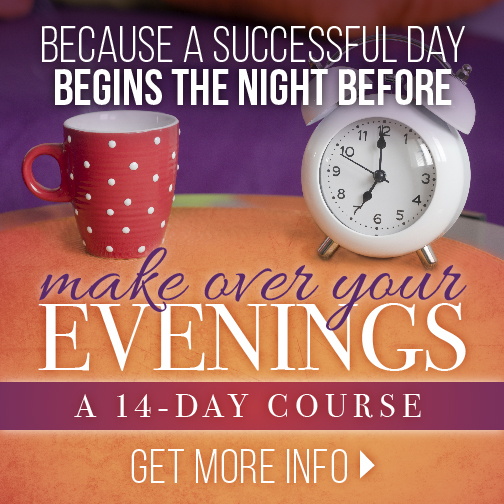 12 Dates – 12 Opportunities to enrich your marriage and encourage others. Go ahead – download the workbook! It has space for you to write your own thoughts – make notes – and I’ve done some of the work for you (like including a few “knock-knock” jokes, and a page of Scripture notes.) It’s free! Hi Lori! 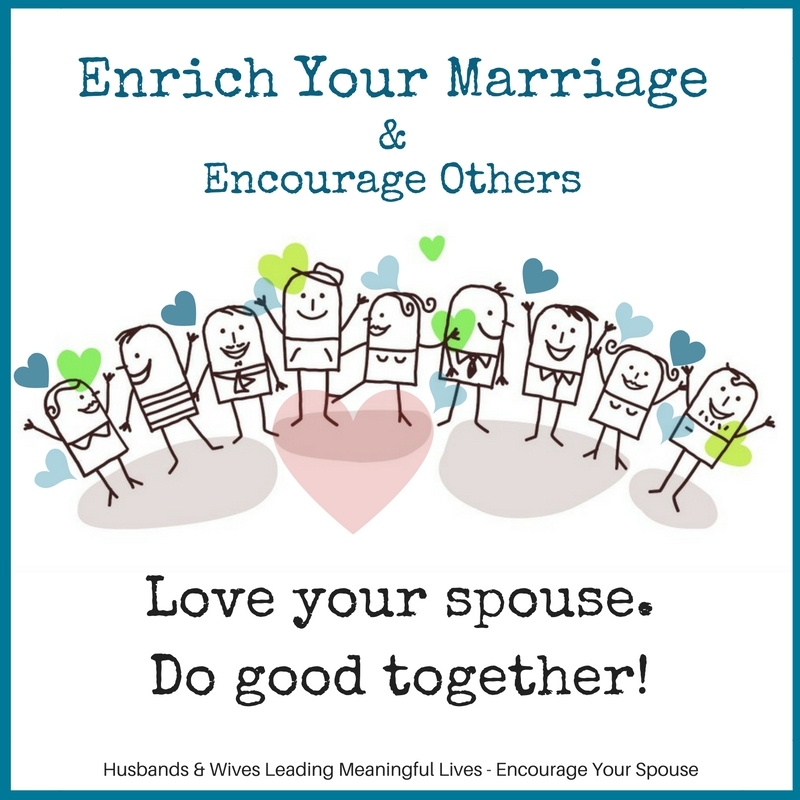 Thanks for sharing ideas on how to connect with your spouse AND encourage others in the process! I just published a book on marriage and relationships and I’ve realized that so many people make the mistake of taking their marriages for granted, thinking they don’t ever have to evolve and grow. Thanks for sharing some great tips on connecting and reconnecting with your spouse. Stopping by from “Christian Women Bloggers Unite.” Blessings!